I love the original Color Me Beautiful and the original make-up book. That first book and TLC’s What Not to Wear first helped me understand style (note, I said understand; sometimes I almost have it, occasionally I will have everything together, and frequently something is wrong, and sometimes I am still in awkward style-less home-schooler land :P). Other sources such as Pinterest, fashion blogs and Good Girls Don’t Have to Dress Bad helped me as well. I still love all of these sources of course, but Inside Out Style Blog compiles and expands on everything. More body shapes are given (much more realistic than grouping everyone into four or five categories), and I think the stylist herself considers herself a mix of two. I also really appreciate the extra help for certain body areas, for example what to do for disproportionately long or short legs. She has hairstyles for face shapes. Which I recently used to help me decide to get fairly heavy bangs, and chop off another eight-ish inches from my hair (I chopped eight off from my almost waist-length hair in May). Earrings style for face shapes. Accessory guides (I have a long waist, so to break it up I should wear wide belts in a contrasting or noticeable color). She also has color guides, but besides finding your color she assists in putting them together. I LOVED this. Contrasting or monochromatic or triadic (I do not know exactly what the term used is). Making sure the colors match in intensity (something I did not think about, “Oh, now I know why certain outfits do not work). I received one Thred Up order (during a major sale) and then promptly ordered another batch of clothes. I also picked up some $1 things at Clothes Mentor a couple weeks ago, most of which need to be altered or used as fabric. I also ordered three of these sweaters from Chadwicks (the square neck is a good style for my sloping shoulders); I now have five and if they continue to put out new colors I will buy more as I find more colors that suit me. My fall/winter style is already much better than last year, but the shoe and scarf category is still majorly lacking, and I need a grey coat. 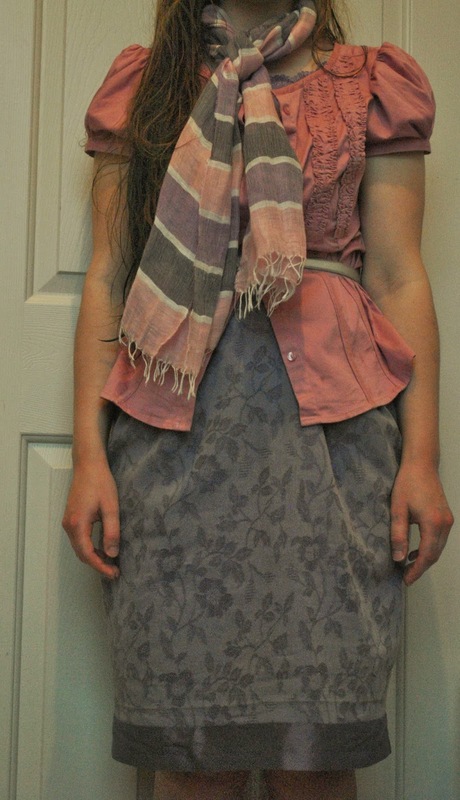 I think I may make some scarves from some of my thrifted items. To top off this fashion post; I just got my second job, a job at one of our local Clothes Mentor stores! I was reading the post of one of the other ladies participating in the challenge, and she mentioned calling the tops button-ups. I thought, “Oh, I have been titling all my posts that; is the challenge really button-down?Yikes!” Then I looked at my posts; I had typed button-downs for both even though I usually call them button-ups too, I think. I usually wear my tops tucked in (even sweaters often), but I thought leaving the blouse out and belting it would work better both because it is new to me and because the bunching if I tucked it in would bother me today. 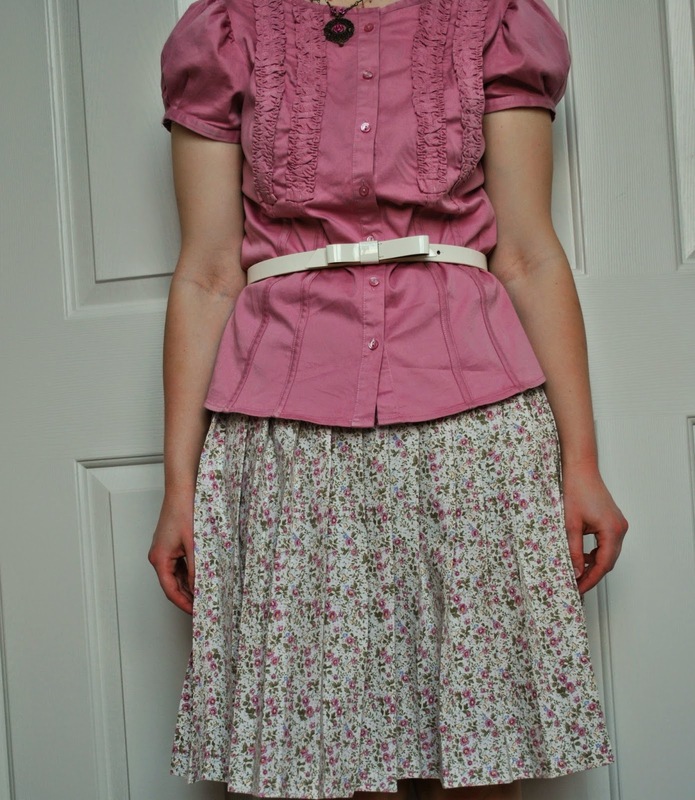 Oh, and I made the skirt a couple years ago. It is about 3 times my waist and knife-pleated and then attached to a very poorly made waistband (I wear belts over it at least sometimes). 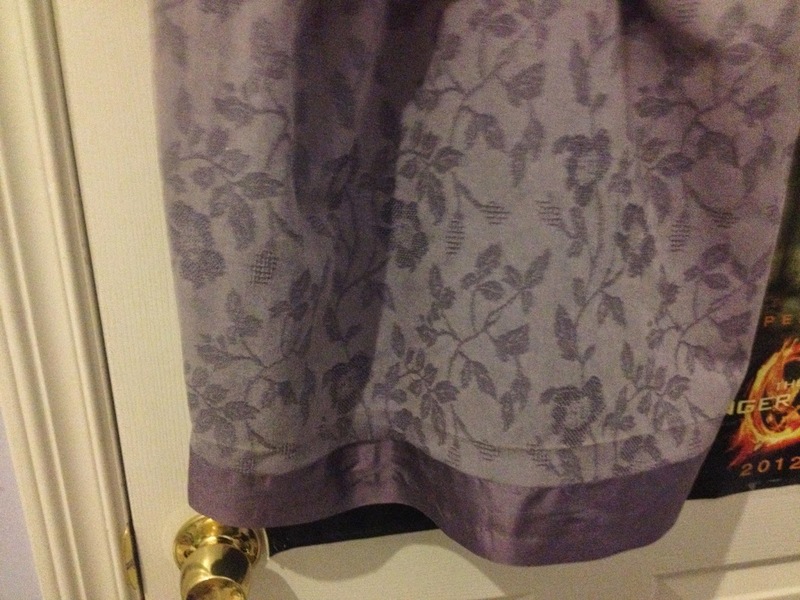 I like all the colors I can pick up from the pattern, and the skirt also goes with other colors not in the pattern. No more alterations for this outfit, but I finished altering two of my hand-me-down skirts for my sister, sewed on a new skirt for myself, and worked a bit on another alteration for myself. I finished Under the Lilacs. I forgot to mention a couple other random thoughts on Wednesday. The Dickens allusion that I recognized on like page 4 made me quite happy. Yay! “I get that reference!” I thought the name “Thorny” semi-interesting . . . and then after I few pages I read his full time of “Thornton.” Yes, I love it! Oh, and then later on in the story Miss Celia reads from Maria Edgeworth to the children. I love literary references in literature! This is my favorite one of my three outfits (I had to plan them out to make sure I could do the challenge nicely or perhaps even at all). The dress (yes, I did another top-over-dress styling :P) I bought from a discount designer store for somewhere around $15 (I think), but the original price was probably $100-$200. The store carries discounted designer goods (including Prada, I call it the snobby store), and I bought this for 90% off, so yeah. I think the brand is Baraschi which I have never heard of before. 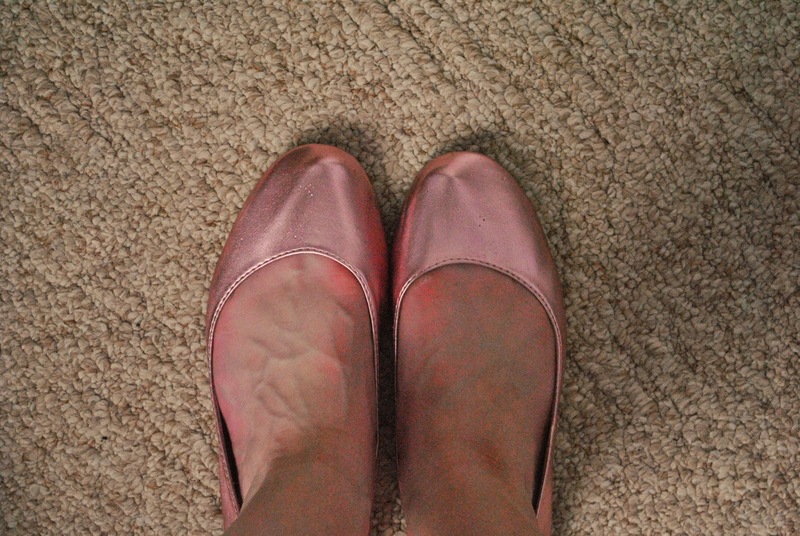 So brand shoes from Kohls. I also have these in shimmery blue and silver (but the silver are a bit too small), and I want the green ones too (and I wish they had them in purple too); they are kind of like Easter egg shoes, or just plain Easter shoes, but I prefer the former description. Kohl’s had them on sale plus I had 30% off, so they cost about $12.60. On the same Kohl’s trip during which I bought the shoes, I bought mini Eiffel tower earrings ($5.60 with all the discounts), aren’t they darling?! 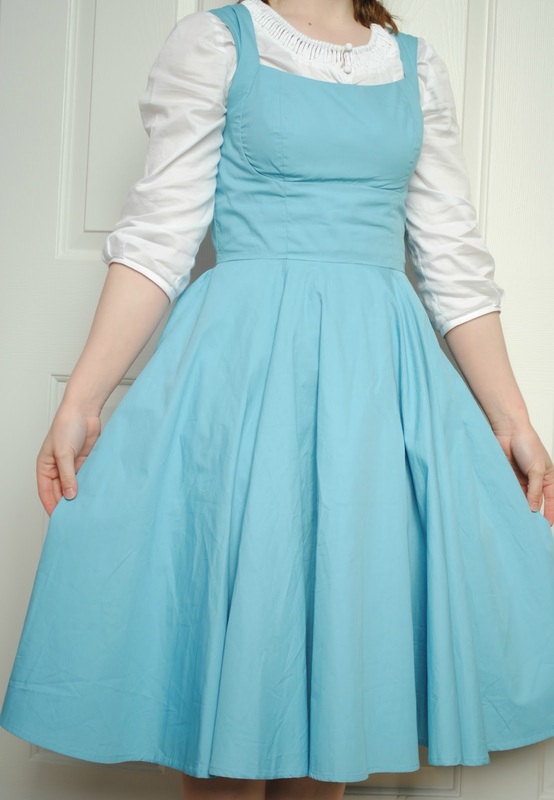 Okay, the dress is my second alteration which I mentioned. 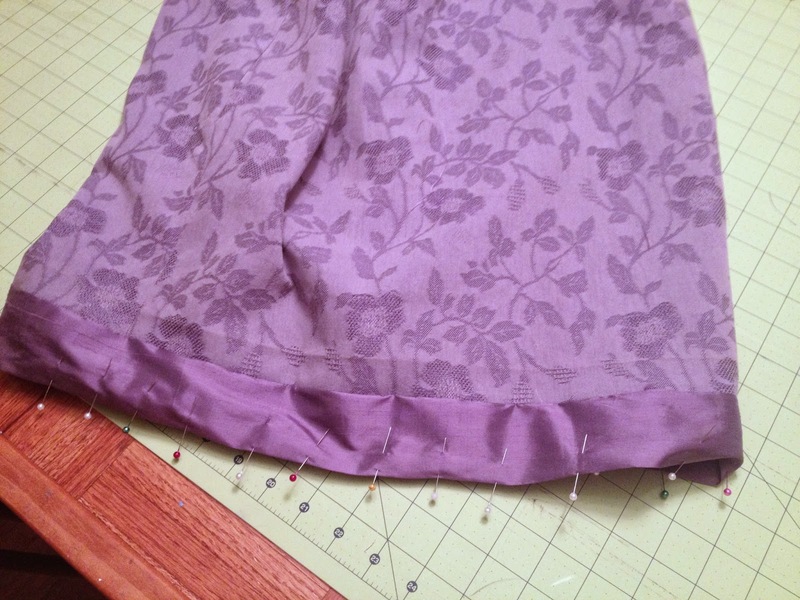 I let down the hem and added a couple inches of silk to lengthen it a bit. Again, I am not very good with taking photos of the whole process . . .
Um, the dress isn’t too tight or too short standing up, but it is both when I bend over and sit down. I guess I will have to bring an extra cardigan to church or wherever I am going to drape over my legs when sitting (I have done that a couple times before) . . . and never bend. I have nowhere to go today, so it is fine now. I didn’t end up wearing this outfit for more than 3-4 hours, it is definitely a Sunday outfit since it is so uncomfortable, and the shoes probably didn’t lasts a few minutes as I was running so late I didn’t go to school since I only had one class and 2/3 of my time is driving and walking. I wore my button down (the brand is The Limited, and I either bought it from Goodwill or thrifted it) over a dress bought from Dress Barn. I don’t find the oxford style of collar flattering, so I altered the blouse. I am not very good about taking a photo before I start taking apart stuff, so I just have one before I cut out the neckline but without the collar. I used that cake stand to cut out the neckline. No, it is not very neatly done on the inside, but perhaps with practice I will get to the point when I sew the inside nicely too. I do need to put a clear snap on the top, and fix the sleeves. I took out the pleats at the shoulder seams and did gathers in the hope that the sleeves wouldn’t be as full, but they look worse. I am not going to touch this until after the challenge though, so I will not get frustrated in the attempt and be unable to complete the challenge. Please forgive the pathetic quality photos; photography is another skill I have yet to learn.